For more info and a list of variances and design waives sought click here. Would this site include Doris and Ed’s as well? All residential or mixed with shopping and restaurants? like a mini Pier Village? No. Right now the property line ends with the marina property. Last night Bollerman said that he does not own Doris and Ed’s. That doesn’t mean he won’t own it in the future. Or perhaps it’s a technicality and he doesn’t own it personally, but maybe through a 3rd party? I’m just speculating with that last part…I really have no clue. Oh, and the 2nd question: Residential. 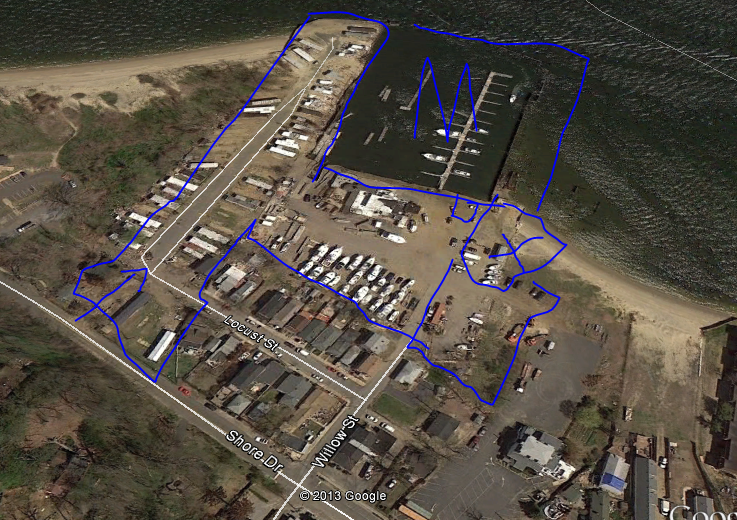 The “commercial” is the marina office, a small store for boating needs, and a boat repair facility. There is one additional office space that they hope will be leased by yacht brokers. One restaurant. There is a pool on-site but that is for those that lease boat slips and the home owners. It’s not open to the public. No jobs either…a hotel would bring in jobs. It’s not a total loss. They are providing public access via a walkway around the marina and hopefully connecting with the county park. It could be worse, it could have been a gated community with no public access. At that end of town I think having a restaurant and marina is enough. I wouldn’t expect there to be much in the way of shops that might rely on foot traffic. That’s a destination and not a thoroughfare. Maybe if he develops the Doris & Ed’s property we’ll get more commercial space. where is the pool? not saying there isn’t’ one, but not seeing it in the architects rendering.. The pool is towards the bottom. The bottom X is the restaurant. Above that is another X, that’s where the marina office will be. To the right of that is the pool. It’s between the marina office & the boat slips. Just like to say that I’m all for development in this town and not against this idea but what I don’t understand is why it is housing and not commercial like hotel that includes restaurant & shops. The town has over abundance of housing stock so it just seems like not in best interest to saturate market with more? I don’t understand why we can’t get interest in a hotel to come in. By doing so we can solicit business such as weddings, conventions, Wall street business retreats, entertainment etc. That will bring people who will spend money in our local establishments, and perhaps more business will open to accommodate more people in town along with bring in prospective investors in already existing housing stock. Not only will we gain property tax but hotel taxes. I also believe that our Mayor and council should include something positive for residents in deal. If we are taking tax abatement hit than provide free taxi ferry service to Sandy hook for residents or something similar to give back to community. I know in many places when developers want to build something and get tax abatement they must include affordable housing or a school(which we don’t need) or park for community. Why can’t this be asked here? I’m sorry but once again no real vision for future just a quick fix that really doesn’t make sense to me with so many homes and lots on the market. There is plans for a restaurant. I believe its that big square with a “X” in it by the proposed parking lot. If I’m reading this right, the entrance looks like its from the road that goes to HH Trail, the restaurant and parking looks to be where Doris & Ed’s is and Locust st & Willow st looks like its going to dead end and not enter into the development. Restaurant with about 120 seats, outdoor dining for 30 – 40, and a tiki bar. The plans right now do not include the Doris & Ed’s property. The restaurant will be at the edge of the property line next to the Doris & Ed’s property (in line with Willow St.), not where the Oyster used to be. Some of the housing will be in the existing parking lot. Entry to the marina parking lot is via Willow, as it is now. Entry to the development will be off of Shore Drive right before Popamora Park. There will be a small road that connects the parking lot to the housing development. I think Bollerman said that willow would dead end. He is raising the grade of that portion and walling it. I think the unsaid plan is to have an entrance through Doris and Ed’s property. Right now the plans only show an entrance on Shore Drive. Do you know where that dead end would be and where the new entrance to the marina parking lot would be? As far as I know the only street being closed off is Locust. Willow Street is needed for access to the marina parking lot. not new – the plans call for dead ends at Willow and locust with walls across the roads. 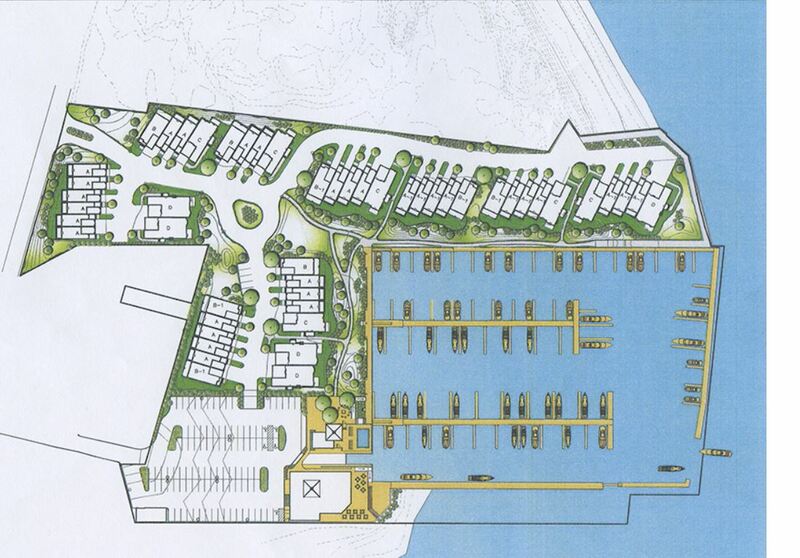 access to marina is through the housing development based on the plan. First, everyone needs to know that the hearing will be continued until the next meeting. It’s scheduled for December 12, 7:30pm at the elementary school. It’s an interesting process. They ended last night with the engineer. They’ll pick up with his cross examination by the board and then the public. Second, I like this project but feel it’s too great of an impact to Locust Street. He’ll make it a dead end and the property around those homes will be filled in and elevated 2′ – 3′ approximately. The site planning was done to maximize views as you enter the property but nothing about views from Locust Street. I have no clue what their views are currently, but if they have any there is a good chance they will be lost. I’m not sure if either of those (dead end and lost views/decrease in property value) is valid reason for the planning board to stop the project. I don’t know if the impact to Locust street is that bad. a) Because they are dead ending the street, they won’t be impacted by the traffic coming or going like they were when Paradise Park was there and when the ferry people were leaving from the Oyster. b) Most of the houses were bungalows and didn’t have views because of the Oyster and boat racks blocked it. If they did have a 2nd floor view, they still probably will when/if they lift their house. c) The houses going up will actually work as a barrier for water surge and protect them from the wind. d) they are still walking distance to the water and the Pompadora beaches. The concrete wall behind the homes on Locust Street is 5 or 6 feet with fill on the other side of the wall, set back 2 feet from the property line. I’m concerened about access to the trail and the beach, how will that be affected. I fear that beach will become “theirs”. if you look at the birdseye map view, you’d access the trail and beach the same way you do today, via the parking lot at the end of shore drive. that doesn’t seem to be changing. i just don’t get why they cant make a small commercial restaurant/ bar waterfront type area. That is what I thought we were getting when I first heard of the project. No surprise I agree. This will affect all of our homes value. Nobody in their right mind will invest in downtown homes when they can purchase in their own private town. If they are looking to sell these homes for 300K-350K you can purchase one in town and even lift for the same costs. I don’t want to sound like a person just against development but once again its about moving forward in a new and innovative direction. What if they don’t sell at all given the state of this town. Would you walk around this town and buy if you could buy somewhere with more to offer like Atlantic Highlands with a Variety of stores, restaurants, Dr offices, art galleries, movie theatre etc. I know a few people that looked at this town and chose to buy in Atlantic because of lack of business, culture and arts here. Just not thinking out of box at all and you really don’t need to think that far out of it so really sad that this is all that is on the table. I asked Bollerman what ballpark price he was thinking for those condominium units and he said around $600,000. I want to learn more from the engineer re: the details of the types of retaining walls being constructed, the existing water table, what seepage methods they have chosen, what backfill is being used, what wind force model did they use, etc. These walls are being built in an existing flood plain for the purpose of elevating the whole site to be out of the flood plain – so this is where you want to make sure they don’t cut corners to save overall construction costs (which in the long run may negatively impact adjacent properties if the wrong approach is constructed). But given all the parties involved ( army corp, federal DEP, state, local, etc) I would guess they covered the proper engineered solutions for a flood plain and hurricane prone area. Still need to ask and verify those details at a public hearing ….